There are a few things that you can always expect from a Jaquet Droz product: ingenuity, exquisite craftsmanship, and time honored technique. Their Signing Machine is no exception. It has been in development for four years has now been launched as part of the brand’s 280th anniversary. This automaton consists of some 585 parts and is fully mechanical. The machine must be unlocked using a 4 digit pin code before it can be used. Inspired by the Writer and the Draughtsman, this machine is capable of carrying out perfect, consistent signatures with the help of a reworked movement. The machine is the subject of two patent applications and can now complete two full signatures before needing to wound using the lever on its side. The automaton’s complex mechanism is assembled and finished by hand and it’s “programming” (coding of the signature) is also done by hand. Even the outside is beautifully polished and finished with hand-engraved red gold or blackened hardwood. The portable device comes with its own leather pouch and is presented in a wooden box. 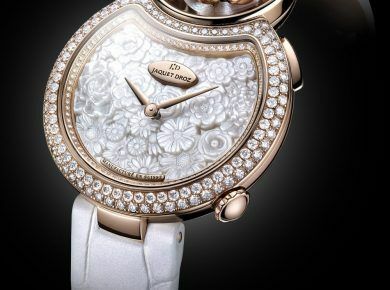 Absolutely exquisite, and limited edition, the Signing Machine is undoubtedly a luxury item with its $367,500 price tag.